Students appearing for their Class 12 Board exams will be able to heave a sigh of relief with the declaration of Goa Board HSSC result 2019. 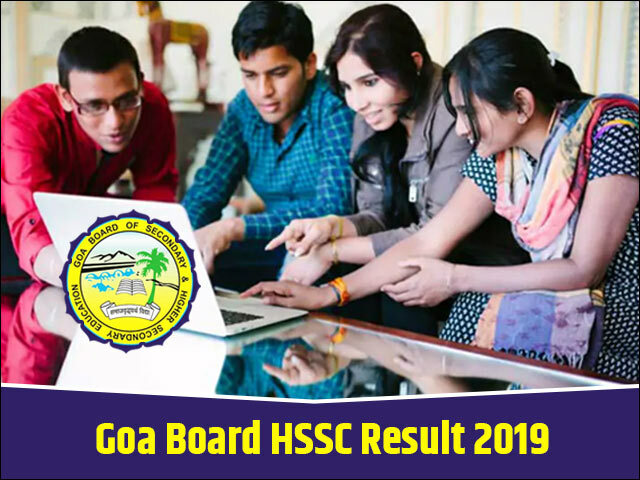 The Goa Board of Secondary and Higher Secondary Education (GBSHSE) will declare the Goa Board HSSC 2019 result by the last week of April. For the convenience of the students, the GBSHSE will publish the Goa Board Class 12 result 2019 in the online mode as well. The result of Goa Board HSSC 2019 will also be published here on this page of our website. JagranJosh will update live links to check Goa Board HSSC result 2019 here. Students must bookmark this page and visit it on a regular basis to stay updated on all the latest developments on Goa Board HSSC result 2019. Following the opinion of the experts, the GBSHSE Class 12 Result 2019 is expected to be announced around the last week of May 2019. However, the above date is assumed on the basis of previous year records and various media reports. To give credibility to their claims, experts are pointing out that the Goa Board HSSC Result was declared on April 27 last year. The exact date of the GBSHSE Class 12 Result 2019 is expected to be officially announced soon by the GBSHSE. The HRD Ministry has directed all state boards including the Goa Board to declare Class 12 Results early to facilitate the compilation of data for IIT-JEE Rankings and other institutions. Keeping this in mind, the Goa Board is expected to announce the Goa HSSC Result 2019 at the same time. Until the Goa Board officially announces the Goa Board 12th Result 2019, the students can keep track of latest news and announcements about GBSHSE Class 12 Result 2019 here on this page of jagranjosh.com. On the day of official declaration of GBSHSE Class 12 Result 2019, the students will not need to look further as they will be able to view their GBSHSE Class 12 Result 2019 right here on this page. The students, who want to stay updated can also subscribe for email alerts under which curated alerts about Goa 12th Result 2019 will be shared with you from time to time by our team directly into your inbox. For this, you can submit your mobile number and email id in the form provided at the top of this page. Where to check Goa Board HSSC Result 2019? Once the final date for the GBSHSE Class 12 Result 2019 is announced by the board, the same would be notified on this page of our website. In addition to this, the students will also be able to check their results online on this page, once the result is officially announced from Alto Betim office of the Goa Board. To receive such important news and updates related to Goa HSSC 2019 Result date, submit your mobile number and email id on this page. Our team will share the most relevant information and news about the Goa Board Results with you directly in your inbox. The previous year data of the GBSHSE Results can always give students an insight into the expected scores in the Goa HSSC Result 2019. The previous year data of Goa HSSC Result can make you familiar with the strictness or leniency of the process of evaluation. Judging by the Goa HSSC Result 2018 scores achieved by the students, we can clearly see that the evaluation was done as per the parameters and marks were awarded to the students as per their performance fairly. The GBSHSE declared the GBSHSE Class 12 Result 2018 for all the three streams i.e. Arts, Commerce and Science was announced on April 27. It is imperative that a lot of students will be fixated on their computer screens browsing through the number of pages trying to get to the first glimpse of their GBSHSE Class 12 Result 2019. Officially the board will host the GBSHSE Class 12 Result 2019 on their official web portal i.e. http://gbshse.gov.in/. However, the official portal might face technical glitches and become stagnant due to large number of users on the day when the GBSHSE Class 12 Result 2019 will be announced. To check the Goa Board 2019 HSSC result you just have to register yourself here by entering the required details. Once you hit the submit button, you’ll be able to download your result. The students are notified by the board to consider the online Goa HSSC Result 2019 for information purposes only, the official mark sheets will be sent to them through the proper channel in due time. The students who for some reason are not able to secure the minimum required marks in the Goa HSSC Result 2019 will have the opportunity to take re-exam in the form of supplementary examinations. The application and procedure to apply for supplementary examinations will be here notified soon. The supplementary examinations will be conducted in the month of May 2019. The students who feel they have obtained unsatisfactory scores in the Goa HSSC Result 2019 can opt for the re-verification or re-checking by paying a nominal fee per exam paper. More information about the process of re-checking Goa Board HSSC result 2019 can be obtained from the official website and from respective schools. The rectified scores will be mentioned in the Goa HSSC Result 2019 mark sheets and the revaluation result will be declared within one month. The Goa Board of Secondary and Higher Secondary Education (GBSHSE) was established in the year 1975 through the Goa, Daman and Diu Secondary and Higher Secondary Education Board Act, 1975. The responsibilities of The Goa Board of Secondary & Higher Secondary Education (GBSHSE) includes advising the government on education policies, implementation of education policies in the affiliated schools and conducting evaluation through yearly examination at secondary and higher secondary level. In line with this, the GBSHSE conducts the annual board exams for the SSC and the HSSC students every year in the month of March-April followed by the declaration of Goa Board Result in the month of May. Goa Board has postponed the Class 12 Exam which was scheduled for 18th March after the demise of Goa CM Manohar Parrikar. Postponed exam rescheduled to 27th March 2019. The Goa Board of Secondary and Higher Secondary Education (GBSHSE) has declared the GBSHSE Goa Board Class 12th Result 2018 today at 10 AM. The Goa Board of Secondary and Higher Secondary Education have declared the Goa Board HSSC 2018 result on the official website, gbshse.gov.in.